Just after starting this novel a gentleman riding across from me on the metro and pondering the cover asked me, “So what makes an alien landscape, and why does he love them?” I speculated rather generally and explained I had only just read the first chapter. This wasn’t the only comment I’ve gotten while reading this about the cover and title, something that sadly can’t occur with eReaders. The reactions and questions I got are testaments to the draw, the hook, of the evocative cover and title. The title is representative of the care that Wendland has put into this novel from cover-to-cover and how so many aspects of it can be compared back to those words The Man Who Loved Alien Landscapes. The plot also first unwraps with a typical series of hook. Something monumental – and dangerous – is unexpectedly discovered in orbit of an alien planet by a group of people and one of them, Henry, ends up murdered. This crime leads the police to the novel’s protagonist, Mykol Ranglen, who is somewhat unwillingly dragged into the fray of the situation, as it escalates from a simple murder and missing person’s investigation to a hunt for an artifact that can alter or destroy human civilization. The cops seek out Ranglen because he is an acquaintance of the deceased, linked to him through Mileen, an artist and former student and lover who had become Henry’s fiancée. Mykol Ranglen is a poet and lecturer who values privacy and separation from others, including the various governmental factions that control Earth and extraplanetary settlements. However, Ranglen cares deeply for Mileen, and her disappearance following the murder of Henry leads Mykol into a personal quest to locate his love and learn what happened on the voyage through space to lead to the situation. Ranglen already has a fair idea of what may have occurred, but it is a secret he has divulged to very few, and is not about to tell the police. Ranglen is responsible for locating a technological artifact of an ancient, long-extinct alien race, one of a handful of related artifacts (called Clips) which have given humanity blueprints for the development of interstellar travel and stations. With his artistic appreciation for things alien (such as landscapes painted by Mileen), Ranglen seems to have a related knack for locating the mysterious and small Clips. And it is this ability that led Henry to seek his help when Henry learned about the potential location of another Clip. Ranglen knows from personal experience the power of greed and desire to find a Clip and win the wealth and renown that could come with it, factors Mykol has eschewed. He also understands the danger that more incomprehensible technology could have for humanity as it accelerates at break-neck speed, and the possibilities of it falling into the wrong hands. It is truly astounding how much Wendland is able to fit into The Man Who Loved Alien Landscapes. With forward momentum from its start, the pacing is ideal. A mixture of adventure, mystery, and science fiction, each aspect is included in the recipe in just the right proportions for the scope of the tale. The intricate web of the plot and its characters makes Wendland’s work particularly impressive for its size. Overall coherence is managed while also delighting readers with details into the world, such as some of the ‘hard’ science behind the technology (as far as the characters can understand the alien tech). He also includes tidbits into past history that could be further developed into future works. Though remarkable in execution, the word-count constraints on Wendland’s novel do show in some areas. There just isn’t space to develop characters other than Ranglen. The other characters range from complex to thin and some of their changes in behavior from one part of the story to another feel rushed or forced. Along those lines, the Big Bad seems particularly like a caricature of a Bond villain. His motivations are given to the hero in a rush, just as his plan is going to come to fruition (of course to be thwarted). This Bond-like quality to the novel may be intentional, and the title itself is reminiscent of a title one might see for a 007 adventure. On the surface then, The Man Who Loved Alien Landscapes is a well written science fiction adventure, a story complete within the confines of this volume, but allowing for the development of further fleshing out. Wendland certainly whets the appetite of the reader, but nicely also leaves you satisfied. But, The Man Who Loved Alien Landscapes isn’t just an entertaining sci-fi adventure, it is also about some interesting deeper issues, again alluded to within the title. The title gives a sense of desire – of not merely an appreciation of ‘alien landscapes’, but also of an intense yearning for them. Indeed, the novel begins with a chapter entitled “The Finding” and closes with one entitled “The Longing”. In between is really a dialogue, even a conflict, between these two ideas. The theme is embodied in the general plot, in the relationship between Ranglen & Mileen, in the antagonism between Ranglen and the villain, and the paradoxical personality of Ranglen himself. In all these there is a sense of longing for something, and even when something is found it isn’t necessarily enough, or it comes at a price, such as giving up a piece of oneself or of independence. Ranglen is described as a “loner” and “paranoid”, and indeed he is. Though he wants to be left alone, other desires overcome this (such as a yearning for Mileen and her happiness/safety). Yet even without this, Ranglen seems to be constantly dreaming, on the move searching for something more to reach that ‘alien landscape, or that ‘undiscovered country’. He is the person that goes to a party and wants to sink into a corner, yet deep within is simply yearning for some kind of human connection. He is someone who can’t stay just with themselves and the familiar because they crave something new, alien, and beautiful. Despite a life full of secrets, Ranglen seems unable to prevent divulging them, illustrating this conflict between the two extremes of separation and a longing for engagement, sharing, and adventure. This theme is born out most directly in a key conversation between Ranglen and the villain about half-way through, highlighting the similarities and differences between these two strong-willed characters and echoing the alien conflict that has set up the present situation for humanity and the characters in this universe. 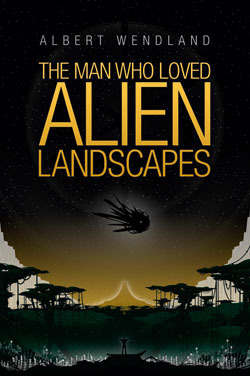 Thus, The Man Who Loved Alien Landscapes is a notable book in many regards, and I’m not surprised it is written by a professor with combined experience in literature and in science. The book has deservingly been recognized by Publisher’s Weekly, but it is a shame that it does not have wider recognition to date. This is something that I should have seen on those “Must read” lists on speculative fiction themed sites like Tor.com or io9. This should attract a wide audience in the genre, and I can’t recommend it enough.